Over 30 dogs trained by Woofability lined the route to the crematorium at the funeral of the charity’s founder, Jenny Clarke. A E Joliffe & Son – part of Douch Family Funeral Directors – said they’d never organised anything quite like it. 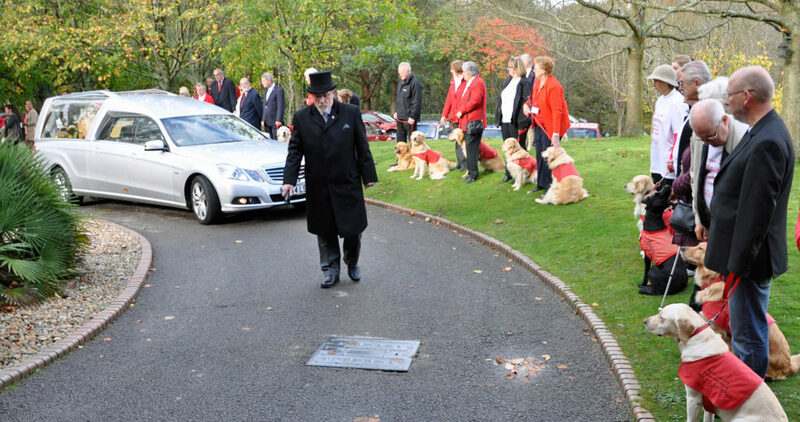 Jenny died last month aged 59 and over 200 mourners accompanied the dogs at the service in Poole. The charity was set up five years ago by Jenny and husband Andy to train dogs to assist the disabled. Nearly 50 golden retrievers and labradors have so far been through the three-year training programme and money is always required to train more. Jenny, from Ferndown, was disabled more than 20 years ago following a work accident and used a wheelchair. Andy said: “The funeral was a great tribute to Jenny and she would have loved seeing all the dogs there. “They lined the route to the crematorium and then all came inside for the service. “We have started a fund to train a puppy which will be called Jenny Junior and we have over £2,300 already so far. At the funeral Suzie Feist, Jenny’s Cousin, spoke about their life-long friendship and John Stone, a friend and supporter of the charity, also spoke. He said that Jenny would have known everybody’s name at the funeral and, more importantly, known the name of every dog. After the service Andy and the couple’s daughter Sarah released a dove each to remember a wife, mother and someone who has done so much for the disabled.